When preparing for Valentine’s Day, save yourself the fight through crowds to get to the florist or the chocolate aisle in your local food store. With a little bit of planning, you can create a home-made gift for someone you love on Valentine’s Day. A home-made Valentine’s Day gift will hold so much more meaning than an anonymous box of chocolates, although you can add these too if you know they will be appreciated by your Valentine. For a simple gift that the kids will enjoy making, you can get into the romantic spirit of Valentine’s Day by removing the labels on bottles of drink and replacing them with “love potion” labels that you can print off for free from websites. You can make your own adult versions with a customised wine label with a promise added. Buy some plain cotton or linen towels for the kitchen and using craft paints and letter stencils, leave a message on the towel that will remind them how much you care. You can write in freehand or draw a heart to say I heart you. Use bold colours like fuchsia and gold and get creative. Make lines using masking tape and if you need further help, look online. Heart-shaped bath bombs scented with sensual jasmine and sandalwood will leave skin moisturised and fragrant, perfect for Valentine’s Day. If you’re a novice with essential oils, just look for the bottle in the shop that says Love Potion, where the mix is already made for you. Other scents that work well are sweet orange or try vanilla. Recipes are available online. Remember to leave yourself enough time for your creations to dry out in the moulds. Create crayon hearts made from the stubs of crayons you no longer use, or buy some cheap crayons to make fun treats for little people. Separate the crayons into colour groups so that you have reds and pinks together, oranges and yellows etc. remove the paper from the crayons which then need to be broken into 1cm pieces. Put similar colours into a pan, mixing light and dark shades and a piece of contrasting colour for effect. Poor into heart moulds and bake at 225F for about 10 minutes. Your kids will love making these and they’re fun to gift too. 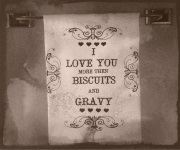 Write a love note to your Valentine. Tell them how much you appreciate them, what it is that you love about them and how grateful you are to have them in your life. For an added fun and decorative touch, buy some large pink or red paper-clips and twist these into heart shaped designs to clip on the edge of the love letter. It also means you don’t have to go searching for an envelope. Etching a Valentine’s Day glass is easier than it sounds. If you’ve ever etched your name in the bark of a tree or doodled a little love on your schoolbook for your first crush, then try this. This idea is best for adults as the etching cream can burn. Use stickers to create the outline of your pattern – a heart’s a good idea. Inside the heart you might want to include your initials, spelt out in stickers too. Apply etching cream to the glass with a brush and follow the instructions given by the manufacturer of the cream. Once the cream is rinsed off and the stickers removed, the glass will look beautifully etched. “Cold hands, warm heart” is an idiom based on no scientific truth, but is the perfect excuse for making these heart-shaped hand warmers that can be tucked into coat pockets on long winter days. 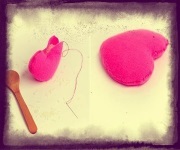 All you need to do is to sew the edges of two felt heart-shapes using embroidery thread. When three-quarters of the heart is sewn, add rice and lavender or essential oil. Evenly distribute the rice and leave enough space so you can sew the hearts shut. Place the hearts in a microwave for 20-30 seconds and you have instant hand warmers. Another easy project is word blocks. 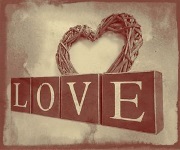 Choose a word you want to display, like ‘LOVE’ and pick some paper that complements the word and pictures or photographs that go with your theme. If you’re adding pictures or photos that you have on your computer, use a picture editing app to get the correct size for your block. Alternatively print the pictures out to be slightly larger than you need so you can trim the excess. Once all the paper and pictures have been stuck on all sides of the block, add one letter square to each block. Seal with acrylic spray and you’re done.